Ransomware is a subset of malware in which the data on a victim’s computer is locked, typically by encryption and payment is demanded before the ransomed data is decrypted and access returned to the victim. Video Guide: GridinSoft Anti-Ransomware What is Ransomware? How big is the ransomware problem? Ransomware is a type of malicious software that prevents or limits users from accessing their system by locking the system’s screen or by locking the user’s files unless a ransom is paid. They force user to pay the ransom through certain online payment methods to get a decrypt key. What is Ransomware? What does ransomware do? How to safe user's PC? Ransomware is known to be delivered as attachments from spammed email, downloaded from malicious pages, or dropped by exploit kits onto vulnerable systems. Ransomware can be downloaded onto systems when users visit malicious or compromising websites. It can also be downloaded by other malware. Once executed in the system, ransomware can either lock the computer screen, or, in the case of crypto-ransomware, encrypt predetermined files. In the first scenario, a full-screen image or notification is displayed on the infected system’s screen, which prevents victims from using their system. This also shows the instructions on how users can pay for the ransom. The second type of ransomware prevents access to files to potentially critical or valuable files like documents and spreadsheets. What does ransomware do? How big is the ransomware problem? Should I pay the ransom? Back up important files in a separate location. And, the best solution on this way is to use Gridinsoft Anti-Malware! How did ransomware get in my PC? How do I protect my computer against ransomware? How do I remove ransomware from my PC? Benefits of using Gridinsoft Anti-Ransomware: easy as 1-2-3! 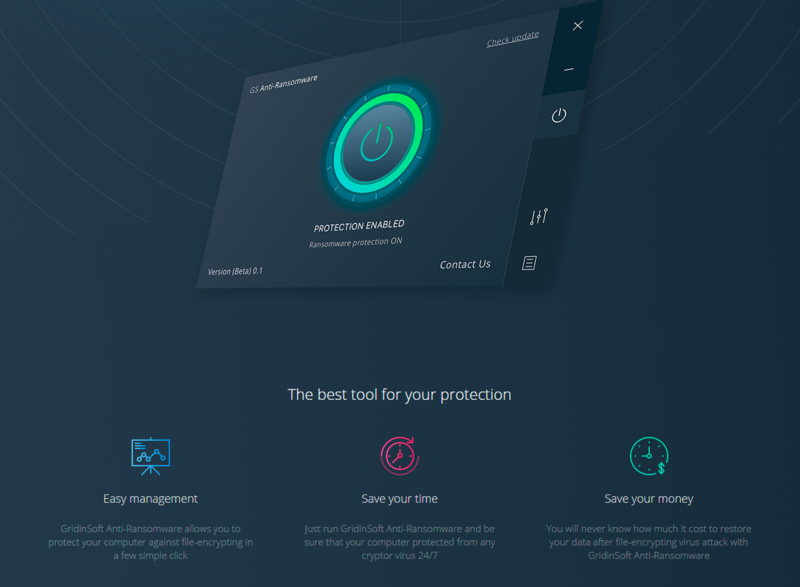 GridinSoft Anti-Ransomware allows you to protect your computer against file-encrypting in a few simple clicks. Just run GridinSoft Anti-Ransomware and be sure that your computer protected from most common cryptor virus 24/7. With GridinSoft Anti-Ransomware you will never know how much is it costs to restore your data after file-encrypting virus attack. Gridinsoft Anti-Ransomware could be downloaded at Our Official Site or directly here. The easiest way to download Gridinsoft Anti-Ransomware is by clicking Download Now button on Gridinsoft Anti-Ransomware’s download page. Visit the Gridinsoft Anti-Ransomware apps page at anti-ransomware.gridinsoft.com. Click Download Now button and wait for the file to download. Double-click the downloaded file (called anti-ransomware) to install Gridinsoft Anti-Ransomware. 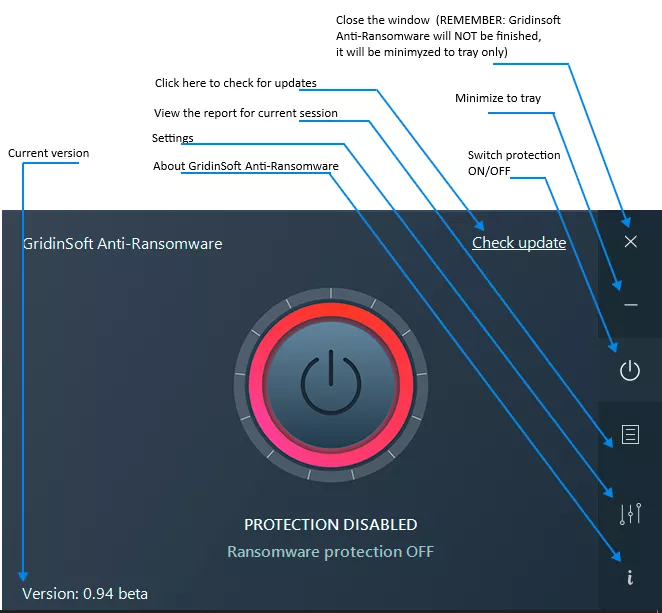 Gridinsoft Anti-Ransomware will launch automatically once installed. Once you’ve installed the app, you can double-click the Gridinsoft Anti-Ransomware icon the next time you need to launch it. 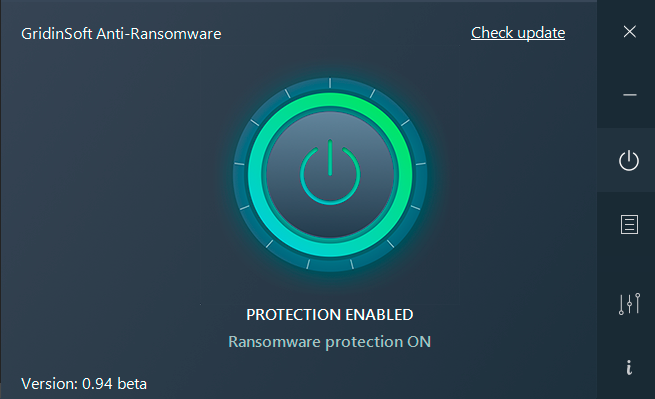 But, remember: protection is working only when it is launched, – so, don’t forget to set Run at Windows startup option ON in Gridinsoft Anti-Ransomware’s settings to launch Gridinsoft Anti-Ransomware whenever you start Windows. Add a shortcut to your desktop. For Windows 7 and Windows 8, click the Start menu, find Gridinsoft Anti-Ransomware , right-click on the file and click Create Shortcut. For Windows 10, find Gridinsoft Anti-Ransomware in your Start menu and drag it to your desktop. Find and select Gridinsoft Anti-Ransomware. With Gridinsoft Anti-Ransomware highlighted, click Uninstall. It is extremely important to have Gridinsoft Anti-Ransomware launched on your PC to stay protected all the time. Besides, don’t forget to set Run at Windows startup option ON in Gridinsoft Anti-Ransomware’s settings to launch Gridinsoft Anti-Ransomware whenever you start Windows. When Gridinsoft Anti-Ransomware is started, it looks like the screen below. We add some explanations to let you be in-touch with this software. How do I remove ransomware from my PC? Should I pay the ransom? What should I do if I’ve already paid? You can turn protection ON/OFF while GridinSoft Anti-Ransomware is started. How to restore from an offline backup? How to restore from OneDrive or GoogleDrive? How to restore my files using File History? How to safe user's PC? How did ransomware get in my PC? How do I protect my computer against ransomware? How to restore from an offline backup? How to restore from OneDrive or GoogleDrive? How to restore my files using File History? Ransomware is a subset of malware in which the data on a victim’s computer is locked (files are encrypted and/or the screen is locked). It then attempts to extort money from victims by asking for “ransom,” usually in form of cryptocurrencies like Bitcoin, in exchange for access to data. More recent ransomware have worm-like cabilities that enable them to spread to other computers in the network. For instance, Spora drops ransomware copies in network shares. WannaCrypt exploits the Server Message Block (SMB) vulnerability CVE-2017-0144 (also called EternalBlue) to infect other computers. A Petya variant exploits the same vulnerability, in adddition to CVE-2017-0145 (also known as EternalRomance), as well as stolen credentials to move laterally across affected networks. Cybercriminals can launch ransomware attacks using other services who then operate the ransomware attacks. They ask for a ransome (usually in form of cryptocurrencies like Bitcoin) in exchange for access to data and then share profit sharing between the malware creators, ransomware operators, and other parties that may be involved. For cybercriminals, ransomware is a lucrative business, at the expense of individuals and businesses. Via email: Ransomware may be installed by downloader trojans attached to spam emails. These email messages employ various social engineering techniques to get you to open the attachment. They can pretend to be credit card bills, job applications, or documents from someone important. If you open the attachment, it installs ransomware on your computers. From the web: Ransomware may also be downloaded automatically when you visit certain sites. These sites contain malicious code known as exploit kits, which take advantage of outdated software to install ransomware on your computer. As with all threats, prevention is necessary. This is especially true for malware as damaging as ransomware. Back up your important files regularly. Consider using the 3-2-1 rule: Make three backup copies, store in at least two locations, with at least one offline copy. Use a cloud storage service, like OneDrive or Google Drive which are perfectly meet user’s need to store and archive your files. You can try to restore your files from backup in the event of a ransomware infection. Don’t click links or open attachments or emails from people you don’t know or companies you haven’t hear before. Make sure your software is up-to-date and you have installed the latest version. When browsing the Internet, use safe browser and be mindful. It is a good idea to have installed Anti Malware Software on your PC and complete the scan regularly. Gridinsoft Anti-Malware is our solution on this field and we update our Threat List hourly – So you can get information about the latest threats in time and be able to get rid of them. Sometimes ransomware could be detected on your PC but still not activated. You are a lucky in this case, because all you need is to get rid of malware on your computer ASAP. Download a copy of GridinSoft Trojan Killer using a clean, non-infected PC. Copy the downloaded file to a blank USB drive and then insert it into the infected PC. Try to restart your PC in safe mode. When you’re in safe mode, run Gridinsoft Trojan Killer. That was a good case. Otherwise, if your PC is encrypted, you can try the last chance – a solution from those who already bumped with such kind of encryptor. Try this site decryptornot.com – tens of known solutions are collected here. Paying the ransom does not guarantee that you will be able to decrypt your files. In some cases, paying the ransom can make you a target for more malware attacks. You should contact your bank and your local authorities, such as the police. If you paid with a credit card, your bank may be able to block the transaction and return your money. If your country or region isn’t listed here, we encourage you to contact your country’s federal police or communications authority. Before you try to restore files, make sure you have removed all ransomware infections from your PC. Use our GridinSoft Anti-Malware to do a full scan of your computer. You can then try to restore your files from an offline backup. If you’re using OneDrive or GoogleDrive, you can try to restore older versions of your files. As part of its security features, they creates an online backup of all connected files when you save or change them. To see if there are older versions of your file, go to this service on the web. Right-click on a file you want to restore and click Version history. If you have Windows File History (or System Protection in older Windows versions) enabled, you can try to restore files. Note, however, that some ransomware also encrypt or delete backups of your files. This means that even if you have File History enabled, but you have set up the backup on your PC, your backups might be encrypted. If you backed up on a removable drive or a network drive that wasn’t connected when your PC was infected, try to restore from that backup instead. GridinSoft Anti-Ransomware works as a vaccine for the computer. When protection is enabled, the ransomware bypasses your PC.